One of my fondest childhood memories remains the Sunday trips to the donut shop for a blueberry donut and chocolate milk I took so often with my dad. I’m sure it wasn’t, but in my mind, it seems like nearly every Sunday morning, this was our date. My donut choices evolved from pink sprinkles, to blueberry cake, to simple donut holes when I got to my pre-teen years. My dad always got a bear-claw. Over twenty years later and those donut dates still feel like some of my best days. Tyler Lee, of Do Good Donuts, is in the business of creating those same lasting memories. Ever since her sweet and humble corner donut shop popped up in our neighborhood a few months ago, it's been a destination for simple, wholesome treats that everyone keeps talking about. “I never thought I would get so lucky and turn my dream of being a business owner into a reality,” Tyler says. In the same year that Tyler gave birth to her first baby, Juniper, she also brought her business to life. Tyler says she’d love to coin the term “donut date,” and that seeing the neighborhood come out to not only support, but also love, her little shop is incredible. Centered around family and quality time with the ones you love, Tyler leans on her own family for support. Considering it's National Donut Day and Tyler owns a donut shop, perhaps we should be sharing a donut recipe! But when I asked Tyler to share something that felt close to her heart, she nearly immediately told me about this savory, comforting Korean chicken stew that she and her husband make weekly for their family. Taught to Peter by his mother and then passed on to Tyler, this one-pot meal is the epitome of simple, good, shareable food. You can easily customize the dish by adding carrots or other vegetables and more or less spice. The Korean culture being passed down to her daughter by Peter and his side of the family is not lost on Tyler. It's a source of pride for their family, and she's proud Juniper is being raised with influence from so many different cultures. 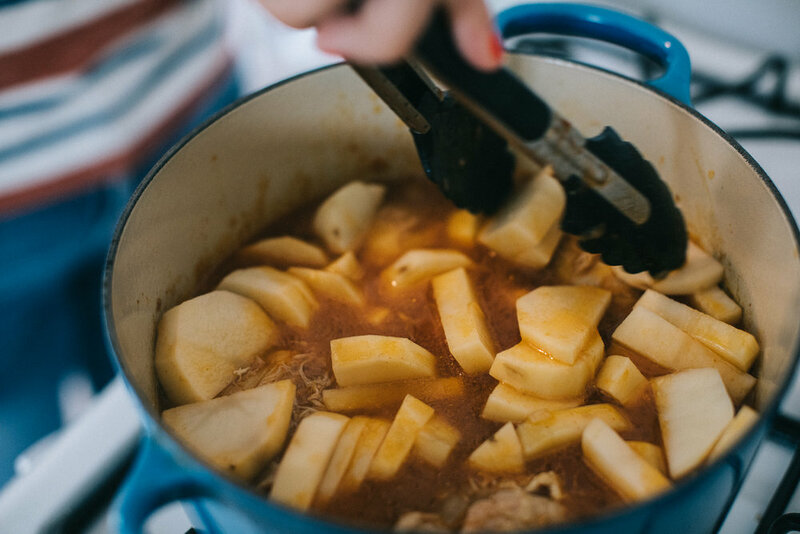 Maybe this stew will be the first dish she and Peter teach Juniper to make on her own. Heat olive oil in a dutch oven and brown both sides of chicken thighs. Toss in chopped onion and cook until soft. Once onions are soft and fragrant, toss in garlic and cook 1-2 minutes. Add potatoes and cook until soft, but not falling apart. Roughly chop or ribbon green onions and dress with soy sauce, rice vinegar and sugar. Taste the chicken and add salt & pepper or more gochujang. Adding more gochujang will add spice to your dish, so add cautiously. Serve over cooked white rice and top with green onion garnish. Enjoy! Honestly, I’m still surprised I made a curry recipe that I love, especially one that I love enough to be sharing with the world. My history with making curry is bleak and discouraging, so I had almost written it off for good after multiple sub-par attempts. We happily resigned ourselves to our local Indian restaurant any time we had a curry craving. But one day a couple months ago, a lone can of chickpeas and a leftover can of coconut milk in the pantry got me thinking I should try again. My beautiful Indian spice collection I inherited from my friend Jessie when she moved last year provided added encouragement. I spent some time Googling recipes and making a list of ingredients I knew I wanted to use — the two cans from my pantry, collard greens and chicken were on the top of the list. I combined several different recipes and methods and landed here, a sweet spot of hearty curry goodness. The first night I made it, we had our friend Nick over who claimed I could put the Indian restaurant out of business! I laughed a lot, but it was so soul-warming that it was all the affirmation I needed to know I had finally made a delicious curry! The next month I made two big pots of the curry for our monthly supper club, plated up ten servings of this deliciousness in our tiny apartment, and loved it even more. I was cooking with the windows and doors open, and everyone who came into our apartment that night told me they could smell the goodness from the road as soon as they got out of their cars! Not only will your house (and potentially your whole street!) smell like heaven, I can guarantee you’ll have some happy & full bellies after you serve this Indian comfort food. I hope you and your people enjoy it just as much as we have! Heat a wok or your largest skillet over med-high heat. Add 1 tablespoon coconut oil and cook the chicken breast until golden brown and cooked thru, about 8 minutes, stirring occasionally. Transfer the cooked chicken to a plate. With the heat still over med-high, melt another tablespoon of coconut oil in the wok. Add in all the vegetables and season with salt and pepper. Cook the vegetables until starting to brown slightly on the edges, but still crisp tender, about 6-8 minutes, stirring occasionally. Add the garlic and ginger, cook for 30 seconds until fragrant. Add in the spices and stir to combine. Add in the tomatoes, coconut milk, lime juice and chickpeas, stir to combine, cook for about 5 more minutes. Add the chicken back in, and cook for another few minutes until heated through. Spoon the coconut chicken chickpea curry over rice and serve warm. Top with more red pepper flakes if you like more spice. In a small heavy pot, add rice, water, 1 tsp oil and salt and bring to a boil. Once the rice has begun to boil, reduce to low and cover about 15 minutes. Shut off flame and keep covered an additional 5 minute. Two of my most popular recipes on C&L to date have been one-pan-pasta & sweet-potato hash, and it doesn’t take much investigation to figure out why. Easy recipes win out — especially ones of the one pot/pan/skillet variety. So, this week I’m truly trying to keep it simple & give you some easy weeknight meals that I stand behind! We all want simple, delicious meals that come together in less than an hour & taste like you’re paying to eat out — I promise, I’m right there with ya! I also realize my recipes on the blog are usually a place for me to try new flavors, techniques, and things that are a little more special than what you’d fix on a typical Tuesday night. But this week isn’t a fancy layer cake, signature cocktail or 18-ingredient dinner — I bring you, SHEET PAN MEALS! These mini meatloaves were inspired from a HelloFresh meal we had a while back — they cook up in no time compared to a normal family-sized meatloaf! The potato pieces steam up nicely in their pouch for easy mashed potatoes. Roasted green beans are always delicious, but you could also sub for broccoli, asparagus, or another favorite green veggie. I hope this sheet pan meal brings some variety and simplicity to your next week's meal plan! Coat a large piece of heavy-duty foil with cooking spray; place potato cubes on foil. Drizzle potatoes with water; wrap foil around potatoes, sealing tightly. Place foil packet in one corner of the sheet pan. Coat rest of sheet pan with cooking spray. Place breadcrumbs, onion, 1½ tablespoons ketchup, ¼ teaspoon salt, ¼ teaspoon pepper, garlic, beef, and egg in a large bowl; mix well to combine. Divide mixture into 2 equal portions. Shape each portion into a freeform loaf on sheet pan. 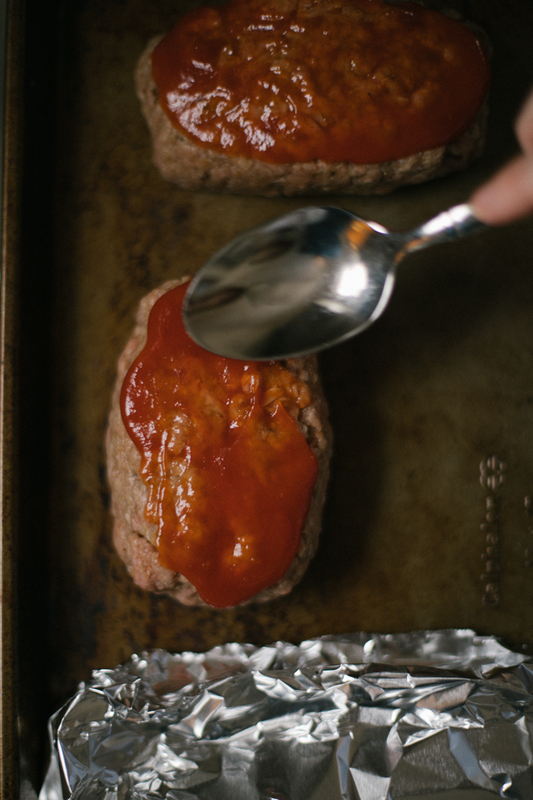 Spread remaining 1½ tablespoons ketchup evenly over meatloaves. Bake meatloaves and potatoes at 425°F for 15 minutes. Combine green beans and oil, tossing to coat. Remove pan from oven. Arrange green beans on pan around meat loaves and potatoes. Bake at 425°F for 15 minutes or until meatloaves register 165° on a thermometer. Remove pan from oven. Carefully open foil packet. Place potatoes in a bowl. Add milk, butter, and remaining salt/pepper to taste. Mash with a potato masher or fork to desired consistency. Sprinkle remaining salt & pepper on green beans to taste. On December 10, 2017, Joe & I laid on our couch (stuffed after lunch) and registered for Weight Watchers — we really couldn’t even wait another few weeks to claim it as a New Year's resolution. (Yes, before the holidays because we are crazy & were desperate to not feel so gluttonous.) But it hadn’t always been so rough. We got married September 30th and felt great in our own skin. Then the honeymoon stretched us a bit — can you say all-inclusive? We ate our way through Jamaica, never turning down nachos by the pool or another drink. But we can’t just blame Jamaica; we came home and ate happily with the same mentality for a couple months until we couldn’t anymore. Our bodies were hurting & we knew why. This isn’t my first rodeo with Weight Watchers — it’s an amazing program, but it has changed quite a bit since I did it in college. Weight Watchers is all about assigning point values to all foods. Now with the freestyle program there are over 200 foods that are worth ZERO points! This was great news & was a big game changer for us. Now, foods like chicken/fish/eggs/beans/plain greek yogurt and most fruits/vegetables are worth nothing, so you can make a really good meal for hardly any points! I’ve loved making sheet pan meals with fish/chicken & roasted veggies and only counting the points for the oil/sauces I use! I made this recipe a little bit yummier for those of you not counting points (i.e. honey & olive oil) but regardless this recipe is full of clean foods & lots of flavor! Now we are two months into Weight Watchers & are feeling great! I’m still working towards my goal, but as of today I weighed in at 18 lbs. less than when we began! I’m grateful for a body that is fitting back into old clothes, and I feel comfortable in my own skin again. (Literally, my old jeans were painful to sit down in.) I know I’ll still be making plenty of delicious meals, like this one, for the blog, but I’m relearning moderation for what’s good and what should be savored in small doses. If you have any good, healthful recipes, please send them our way. We’d love to hear what you’re making as we continue to count points! Preheat oven to 400°F. Coat a large sheet pan with cooking spray. Combine soy sauce, honey, lime juice, 1 clove of garlic, and ginger in a large bowl. Place salmon in bowl. Toss to coat. Set aside. In a separate bowl, combine oil, remaining clove of garlic, sweet potatoes, Brussels sprouts, salt, pepper, and paprika. Toss to coat. Spread on baking sheet, avoiding overcrowding. Bake at 400°F for 12 minutes. 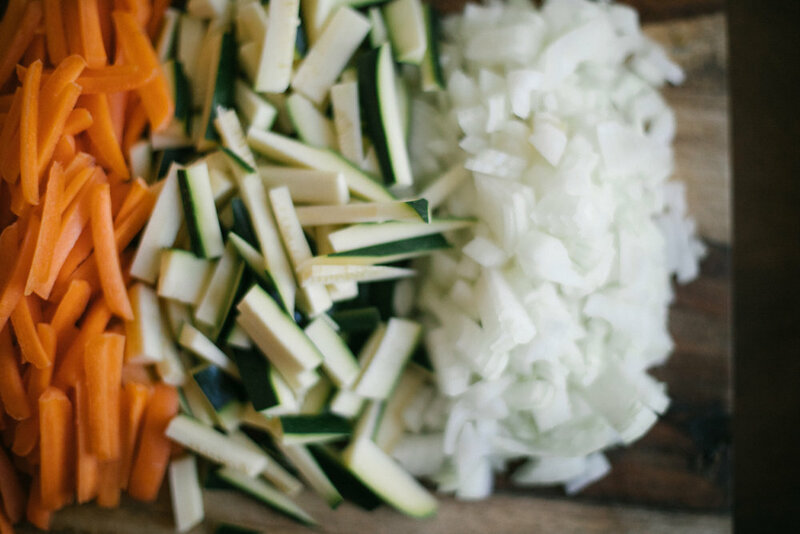 Stir vegetables and push to edges of pan, creating an open center. Place marinated salmon fillets in the open center space of pan. Pour any leftover marinade over salmon. Bake at 400° for 15 minutes. Top salmon with green onion and sesame seeds. Serve with sweet potatoes and Brussels sprouts.